When you have the best coffee machine under $500, every morning starts off perfectly and every evening ends with the perfect punctuation on a great meal. Finding the right coffee machine for your lifestyle is not as difficult as you think – especially if you want to invest in a premium machine. The key is knowing what you need and what you don’t need. Understanding your needs means you will not pay for more machine than you need and that your coffee machine will be reliable – what can be more discouraging than getting up for that cup of coffee only to find that your machine isn’t working? Fortunately, our list has no duds. Our reviews below feature the five best coffee machines under $500. Check out the table below for our top picks. 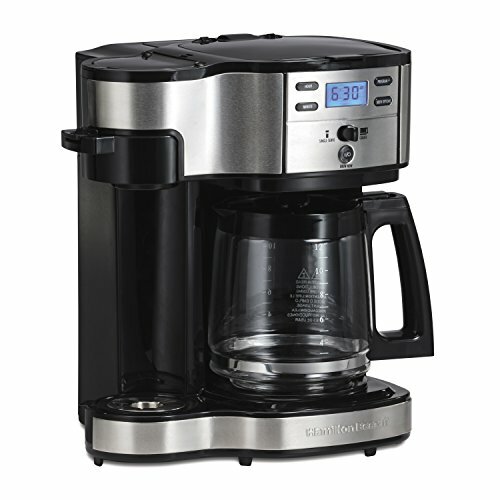 This Cuisinart coffee machine is absolutely one of the best on the market, and the reason why it occupies the top spot is because when it comes to form and function, the rest of the machines pale in comparison to this model. The drawbacks are small but worth noting. The first is the reservoir is a bit of a pain to fill because the opening is small and the water meter on the side isn’t the easiest to read. The chute between the hopper and the filter basket can get clogged with grounds from time to time. However, the brush that is included in the packaging should do the trick with keeping this clear. Make sure you do this once a week. Also, be sure to replace the filters every month so that your water is always as close to pure as possible. DeLonghi believes that having it all is the reason why life is worth living, and their machine, the BCO430, shows that you can truly have everything as this particular machine makes both espresso and a good ol’ cup of joe. When you think about something that does everything, surely there are things that are left behind, and while those will be reviewed in a bit, it is extremely important to talk about what this particular machine’s advantages are. The first is everything is seemingly removable. From the filter baskets to even the reservoir, the goal of the DeLonghi is to make your caffeinated life that much easier. The system has a front loader for the grounds on each side, comes with the single and double walled espresso filters and includes a milk frother as well. The DeLonghi is remarkably easy to clean and maintain, in fact the removable parts mean that you can get in there with a soft brush and ensure complete cleanliness. Another method is to run the machine without any coffee. The versatility of this machine is its biggest selling point – and rightly so. There are some issues the DeLonghi has, however. Specifically, while the unit itself is stainless steel there are not many metal parts, and the plastic parts are quite prone to breaking. Also, many people have reported being less than satisfied with the espresso functions including the milk frother. Basically, the consensus is if you are looking for a drip coffee maker, the DeLonghi does the job with aplomb but if you are looking for espresso drinks it is a bit inconsistent, which makes the price of the unit have an inverse relationship to the value the unit provides. The other problem – there is no grinder for this unit and that decreases the value as well. 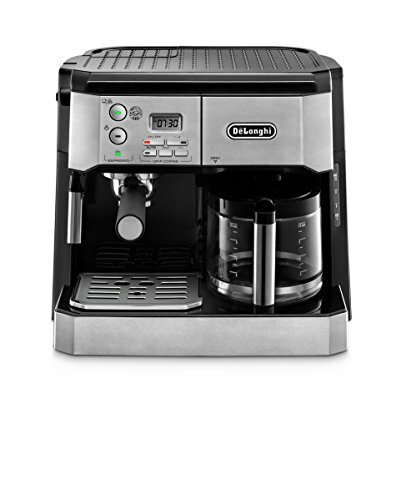 Ultimately, if you are someone who has a discerning palette for espresso, this is not the machine for you, but if you prefer to have a great cup of coffee and the occasional espresso, then you will greatly enjoy the functionality of the DeLonghi. The great thing about Keurig is the single serve feature that has revolutionized how we enjoy coffee at home. Instead of having to grind and brew and then deal with a filter and used grounds, we instead pop in a K-Cup and enjoy a cup of coffee in the amount of time it takes for a television commercial to run. The Keurig is so quick at brewing coffee it takes more time for you to add sweetener and cream than it does to actually brew the coffee. This, among many other reasons, is why the Keurig is so popular with people who love their coffee. A whole industry has sprung up making K-Cups, and in many ways it has the people making the traditional drip coffee makers having to readjust their paradigm. The one thing about the Keurig, however, has been its emphasis on convenience limits its features. Not anymore. The K250 allows you all the convenience of the Keurig model yet has the accoutrements found in the more traditional drip coffee machines. What are some of those you ask? This particular model has different brewing sizes including those for mugs and pots as well. It is available in multiple colors so you can find the right machine for your kitchen, and finally, with customizable controls and a 40 ounce reservoir you can literally make any type of coffee that your K-Cup loving heart desires. The drawbacks, however, are worth noting. The first thing is K-Cups are more expensive than whole beans or grounds. One box yields less cups of coffee than the beans and grounds do. This is not a good value. The other problem is this particular machine is quite buggy. There are some issues with the programmable functions and it takes longer to use than the other Keurig devices. This all adds up to a less optimal experience. Ultimately, if you enjoy all the features of this Keurig, then it’s a great purchase, otherwise it might be best to stick with the tried and true – but less snazzy Keurig machines. Versatility is one of life’s most important qualities – if you are able to do a variety of things well then that means you are a valuable jack of all trades. The hardest thing of being a jack of all trades, however, is the possibility that you could be a master of none of them. 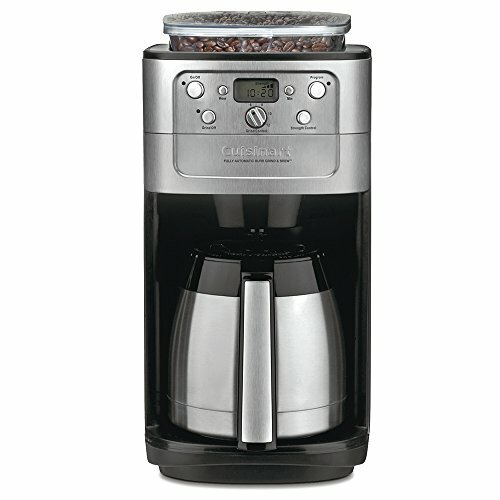 This is the conflict that is ever present in the Hamilton Beach 49980A coffee machine, and ultimately the jack of all trades but master of none dichotomy proves too powerful in some cases to overcome. So, what are the benefits of this particular machine? The benefits are pretty simple in its versatility. 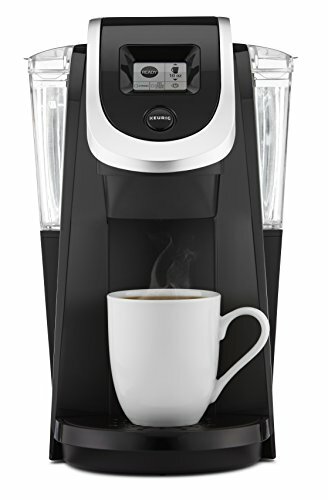 If you are a fan of the K-Cup or other single-serve variety, this particular machine can handle that task along with handling the task of brewing ground coffee. You can get your coffee in a single serve mug, a tall thermos, or a carafe. How you take your coffee is entirely up to you and this particular machine makes sure that you get your coffee the way you want. With lots of removable parts it is easy to clean and maintain and the reservoir is also easy to fill. The disadvantages, however, are also worth noting. The first is on a machine that tries to do everything, how is there no grinder attached to the machine? That seems to be a curious omission. The second is there is lots of inconsistency with the brewing. Many times on the single serve area the coffee comes out warm, not hot. That’s not optimal. 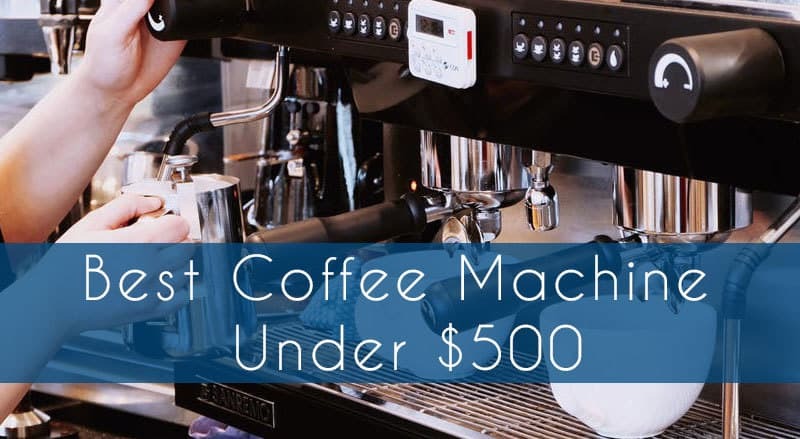 There are some excellent options for coffee machines, however if you are looking for all the functions that this particular machine from Hamilton Beach performs, it is a worthy purchase. If you have a cosmopolitan kitchen then you need appliances that reflect your incredible sense of style and panache. A typical coffee machine will not do here, and frankly, it is a bit insulting to your taste if you spend time creating a snazzy kitchen only to have an appliance that sticks out because it is so bland. Fortunately, the Ninja does not blend in – unlike its namesake. This coffee bar brewer – as Ninja calls it – has one heck of an interesting design and also proves to be fairly functional as well. What is better than form and function coming together to make a perfect cup of coffee? The Ninja makes a valiant attempt at stepping into this void, and for the most part succeeds fairly well. 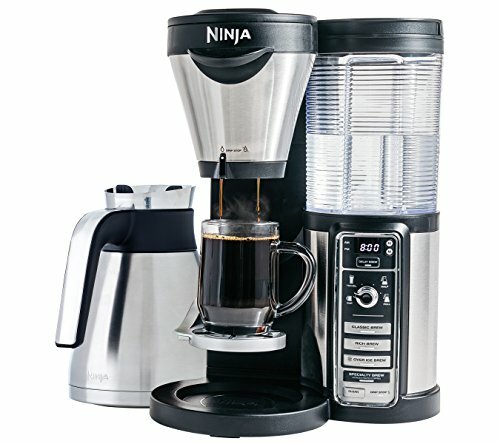 The first nod the Ninja gets is the adjustable settings, you can fill a cup, a larger coffee mug, and even a whole carafe. The other great feature is the removable reservoir along with the ability to make many different types of coffees including cold brew and espressos. The versatility of this particular model has been known to please even the most unpleasable coffee snobs. Unfortunately, the Ninja does have some issues we must discuss. The first is the machine literally does not stay on. Of course, this is a massive issue when brewing coffee. The second issue is it boast a self-cleaning option, but many people say that it does not work all that well, hence why it is being included in the section regarding problems than of neat features. Ultimately, if you can overlook these issues, the Ninja will provide incredible versatility, and really, who can argue against that if you are willing to pay the price. Premium coffee machines allow you to enjoy a cup of coffee the way it should taste. When you invest in one of these coffee machines you are investing in the quality of life you have always sought. Make the best decision by knowing exactly what you need and how to the right coffee machine will improve your life.